Whenever we have leftover pastry or pie dough, Highlander makes “dokeyanas,” a bite-sized snack similar to a cinnamon roll. This family recipe was handed down through generations by Highlander’s maternal grandmother from Canada, according to his sister, Linda R., with whom we celebrated a recent Thanksgiving holiday with her husband Gary and their daughters Nichole and Danielle in Nevada. 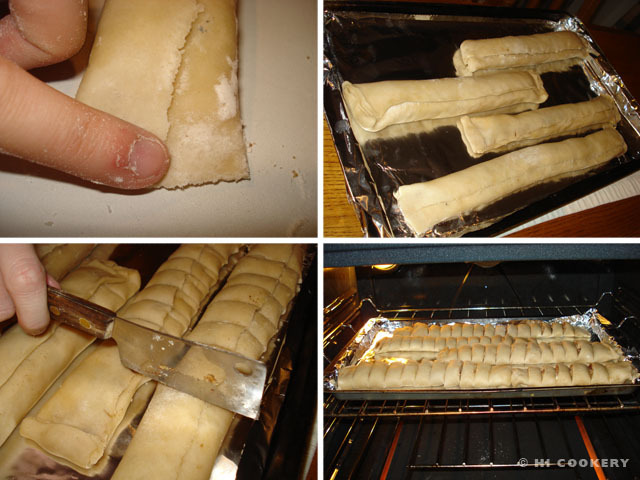 “Dokeyanas” are similar to other pastry recipes using leftover pie dough. 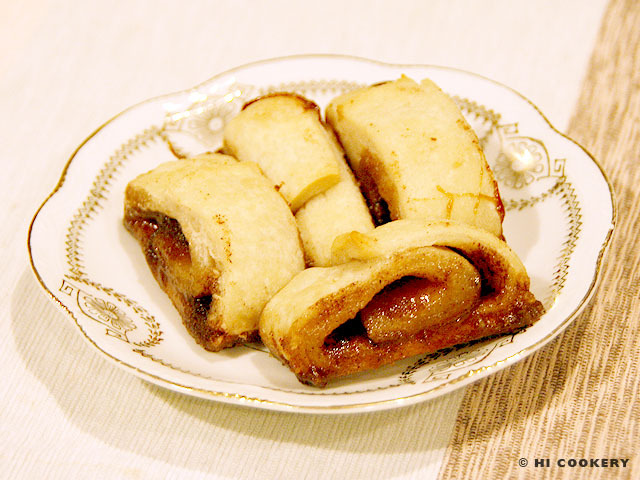 They may be called “pie crust cookies, swirlies, pinwheels or rugelach” “cinnamon snails, slices, roll-ups or spirals,” “gobblies,” “winky dinks,” roly polys,” “dum dums” or “nun’s farts” (pets de sœurs). The latter is a French-Canadian creation for Acadian cinnamon rolls. 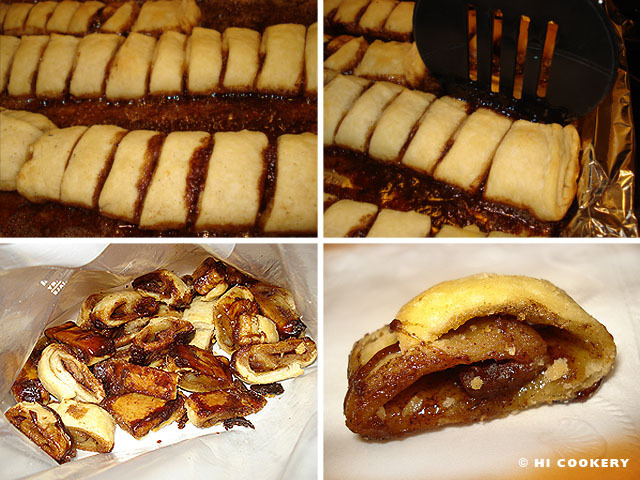 Despite its many names, “dokeyanas” are a delicious way to use up leftover pastry or pie dough. Thanks to our nieces, Nichole and Danielle, for being the guest chefs of HI Cookery and making “dokeyanas” for our blog post for National Pastry Day. Sprinkle flour on a clean surface to prevent the leftover pastry or pie dough from sticking. Roll out about ¼ inch thick. Cut into rectangles. Spread butter or margin on the dough, leaving about ½ an inch on all sides. Generously sprinkle brown sugar on top, followed by cinnamon. Dot with butter or margin. 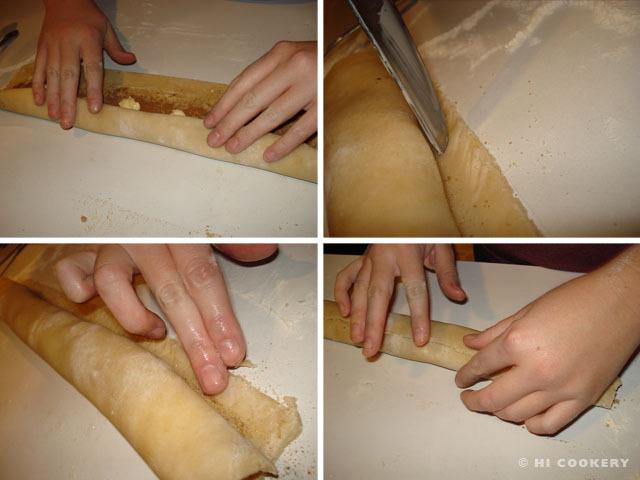 Carefully roll up the dough. Score the edge with a knife and moisten with water. Press down to seal the edges. Pinch the ends of the roll and fold over slightly to close. 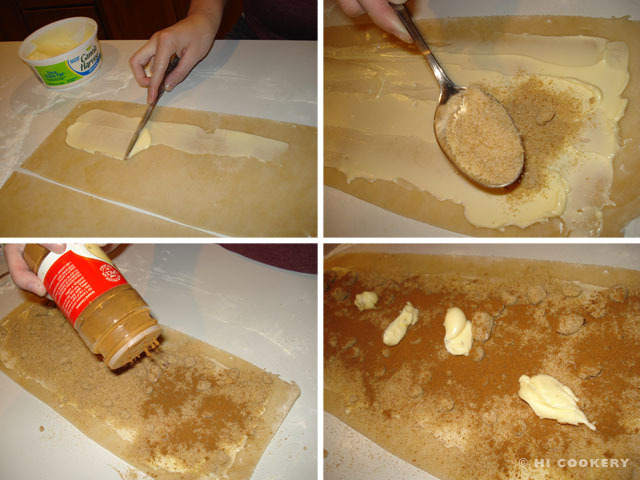 Place the roll(s) on a foil-lined baking pan with edges. Slice them about an inch thick. Bake in a preheated oven at 350 degrees F for about 20-30 minutes or until golden brown. Remove from the oven. While still hot, use a spatula to move the rolls around the pan so the sides get coated with the melted “syrup” before it hardens. Separate the slices and transfer to a foil-lined plate to cool completely. Store in an airtight container. In France, nun’s farts (pets de nonne) are made of choux pastry instead of pie dough and are deep fried instead of baked. 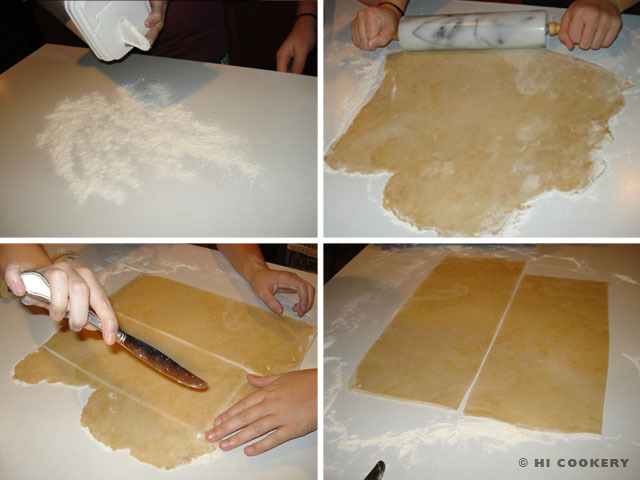 Pre-made pie crust dough, located in the refrigerator or freezer sections of grocery stores, may be used instead of leftover pastry or pie dough. Highlander’s sister Linda made extra of the latter so that her daughters could demonstrate how to make “dokeyanas” for our blog. My mimere would make these with left over pie dough. My mom also. But my mimere called it a tutsianne? Or toutsiaun? Or toutsiaux? I’m not sure of the spelling. But I haven’t been able to find it called what my mimere called it. Has anyone else heard it call that? Or something similar? Hello, Vera. We have never heard of “dokeyanas” name either except through the family. So your grandmother’s family may have made “tutsianne” a special nickname for “pets de soeurs”. The closest word could be “tourbillon” which means “swirl”??? “Torte” means “cake” so maybe “tuts” could be part of your family’s word?